Thailand will hold a referendum on Sunday (Aug 7) on its draft 20th Constitution, in the first test of the military government's popularity since it took power after a coup in 2014. The draft constitution, if accepted by voters, will replace the one scrapped after the military coup and pave the way for a general election in 2017.
b. Do you agree that, in order for the country's reforms to continue and follow the national strategy plan, the constitution should have a section which states that within the first five years of the parliament's existence under this new constitution, the prime minister should be selected by the full parliament? What are some of the key aspects of the draft? - The ruling junta, the National Council of Peace and Order, will select almost all of 250 senators. Six seats in the Upper House will be reserved for the permanent secretary of defence, the supreme commander-in-chief of the military, the army chief, the navy chief, the air force chief, as well as the police chief. - The prime minister need not be an elected member of the Lower House. - The electoral system will make it difficult for any single party to win enough seats to dominate the future government. - In the case of a political deadlock, the president of the Constitutional Court shall convene a meeting with the president of the Lower House, the opposition leader in the Lower House, the president of the Senate, the prime minister, and presidents of various courts and constitutional organisations. Their decision will be final and binding. - Politicians convicted of corruption would be banned for life. What does the government hope to achieve? The junta says the draft constitution - which gives it a major say over the next legislature for five years - will curb political corruption and help end a decade of turmoil in South-east Asia's second-biggest economy. It argues that unstable conditions within Thailand require it to continue to play a role in the future administration. Since coming to power, it has vowed to clamp down on corruption and shape up the bureaucracy. While the draft constitution maps out its goals for cleaning up the police force, it does not make any particular mention of military reform. 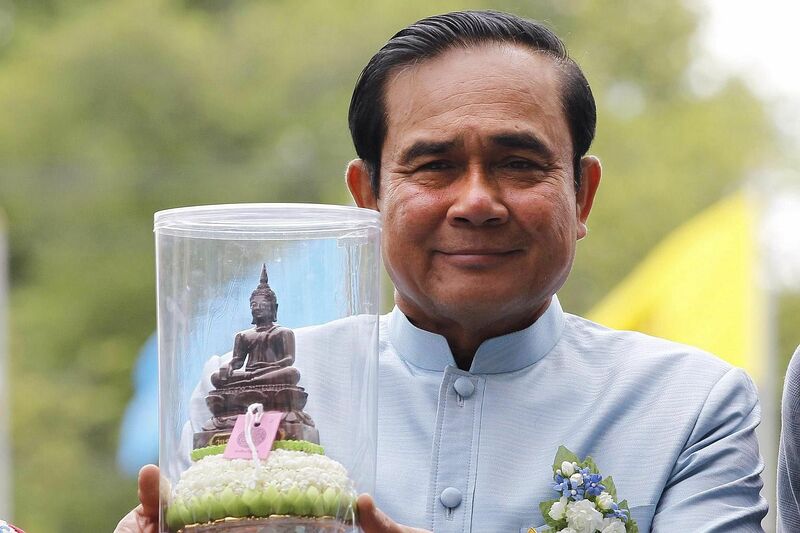 Prime Minister and coup-maker Prayut Chan-o-cha says he will not step down even if voters reject the constitution. But "we need the Constitution," he says. "Without it, we can't reach the destination, we can't have the election." Mr Norachit Sinhaseni, spokesman for the Constitution Drafting Commission, says: "The draft will prevent those that are corrupt... politicians or government officials, from remaining in their positions. Those that have been proven corrupt or have been put on trial, and the courts have decided that they have committed wrongdoings, will be prevented from participating in political activities - basically being banned for life. "I think that it is the major characteristic (of the draft constitution) and something that the Thai people are looking forward to seeing," he says. They say the draft constitution will only entrench military rule, restrict the elected government, and will not mend political divisions. "The constitution is supposed to recognise people's rights, create a balance of power, and find a solution for the country. I don't see any of that in this (draft) constitution," says Ms Yingluck Shinawatra, former prime minister from Puea Thai party. Mr Abhisit Vejjajiva, another former prime minister and current Democrat leader, says "the sustainable way of running the country should be democratic." " Let the people take part in shaping their country's future. Protect the poor and the weak from the abuse of power from the Government and powerful individuals. I don't see this constitution heading in that direction." It's still too close to call, but momentum in the "vote no" camp appears to have gathered after Democrat leader Abhisit declared last week that he would personally reject the draft charter. While a defeat of the draft will likely weaken the legitimacy of the junta, it will still remain firmly in control of the country.